A tinkerer, a traditionalist, and a change agent walk into a center one day… This summer we’ll explore digital literacy programming and informal learning spaces starting from the perspective of a community’s values and goals. What if both the tinkerer — one who finds deep passion in the innovative — and the traditionalist — one who finds great significance in the time-honored — bring important insights to the dialogue? Students are welcome to bring in proposals for class projects with community partners with whom they are already working. For those without a starting project in mind and for those willing to join the group, the primary case will be to work with teen leaders from 4-H and from a teen empowerment program to design an informal learning space and initial programming that inclusively welcomes all teens — tinkerer, traditionalist, and change agent — into the space as co-learners and co-creators. The goal is to advance teen power within themselves and with each other. Studio learning brings together the collective knowledge of the class and community to work on and implement a design solution in community to a real world informatics problem. This is a hybrid on-campus/LEEP course — students can attend studio and work on projects in Champaign, at-a-distance, or any combination thereof. While this course is offered through the Graduate School of Library and Information Science, we seek graduate students and upper level undergraduates from multiple disciplines, such as education, social work, human and community development, gender & women’s studies, African-American studies, informatics, etc. Sections STG (graduate on-campus), STU (undergraduate on-campus), and STL (graduate online) meet concurrently. On-campus students traveling during the summer can elect to join class online as needed. Course Description: Studio-based learning, which is common in art and architectural education, is an opportunity to bring together the knowledge of students, instructor, in-field professionals, and community to address a real-world question in our profession as described below. Students will develop specific knowledge and skills related to the question for the semester while receiving teacher mentoring, in-field professional modeling, and peer support as an engaged information professional leader. While not limited to specific student histories, this studio is a special opportunity to apply learning in the field for those who have already taken or are currently taking instruction/engagement/justice-related courses, including but not limited to Instruction (LIS458), Social Justice in the Information Professions (LIS590SJL), Community Informatics (LIS518), Community Engagement (LIS418/LIS490YS), or the equivalent from other disciplines such education, social work, human and community development, informatics, etc. Pre- and Co-requisites: Junior or senior standing and consent of instructor for undergraduates; consent of instructor for non-LIS graduate students. Individual: To advance the development and exercise of student’s leadership role as a professional by combining real-world community informatics project-based research, studio-based learning pedagogy, and student’s rich past experiences and education. Team: To promote collaboration and teamwork across different domains of knowledge by having students work as a member of an interdisciplinary team within a studio space and in the field applying a critical interpretive socio-technical framework in collaboration with community partners. Community: To prepare students to play a lead role in inclusive partnership development and community engagement on behalf of their community anchor institution by guiding students in a process of racial and cultural awareness, consciousness, and positionality through their engagement with different socio-economic and culturally-based communities. Project: To foster their project management skills by affording students the opportunity to engage in multiple phases of a large-scale community project. Course Structure Overview: Studio-based learning (SBL) is rooted in the apprentice model of learning in which students studied with master designers or artists to learn their craft. The pedagogy emphasis is on “learning to be a professional” as opposed to “learning knowledge needed to be a professional.” SBL is also closely related to John Dewey’s inquiry-based approach to learning. Using SBL methods, this course will bring together students, instructors, professionals from related fields, and community members in a collaborative environment to address a real-world problem or “case.” Project work will be very much student-led, with the instructors and outside experts serving as mentors and professional role models. Students will be asked to work individually and in teams in a working environment meant to closely mirror a professional workspace. Readings, class discussions, and pre-recorded lectures during the first few weeks of class will provide students with background knowledge and information related to the case for the semester to inform creation of an initial plan. The remainder of the semester will primarily emphasize “learning through doing”, with the majority of class time being dedicated to peer support and instructor mentoring to inform project development. Doing project work will require more than the limited time available during class, and students should expect to spend time each week working individually or together as a team outside of class. In this way, as implemented the studio brings together the best of class lab and class discussion formats with a group practicum/service-learning experience. In some cases, this will include travel to partner sites as necessary to collaborate and conduct interviews with stakeholders and collect information needed to create a viable proposal/implementation in response to the needs of the case. Using a Critical Friends approach, critiques will be incorporated into class meetings at regular intervals throughout the semester. Some of these will be informal or “desk critiques” while others will be more formal presentations of progress, culminating in the final presentation of project(s) and critique on the last day of class. Project work will be posted on appropriate course-related sites throughout the semester, and the final documentation will be posted on http://dl4all.illinois.edu. The overall flow of the course is represented by our adaptation* of Brocato’s** SBL design path proposal, highlighting the role that readings, discussion, and community engagement play in our studio design process. * Wolske, M., Rhinesmith, C., and Kumar, B. (2014) “Community Informatics Studio: Designing Experiential Learning to Support Teaching, Research, and Practice.” Journal of Education in Library and Information Science, 55(2). ** Brocato (2009) Studio based learning: Proposing, critiquing, iterating our way to person-centeredness for better classroom management. Theory Into Practice, 48, 138-146. 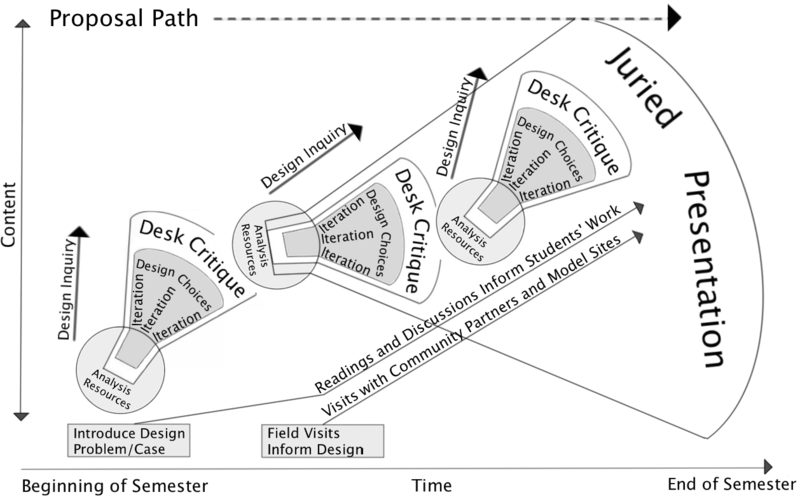 Oblinger, D.G., Editor (2006) Learning Spaces, Part 1. <www.educause.edu/learningspaces>. While written for the college context, it is one of the best overviews of space design, with many concepts that readily generalize. Iris Marion Young (1997) Difference as a Resource for Democratic Communication. In: James Bohman and William Rehg, Eds. Deliberative Democracy: Essays on Reason and Politics. Eubanks, V. (2007) Popular Technology: Exploring inequality in the information economy. Science and Public Policy, 34(2), 127-138. Wajcman, J. (2009) Feminist theories of technology. Cambridge Journal of Economics. Kahn, R. and Kellner, D. (2007) Paulo Freire and Ivan Illich: technology, politics and the reconstruction of education. Policy Futures in Education, 5(4), 431-448. In lieu of meeting on June 10th, everybody will visit and report on an innovation space, such as a digital media center, a Makerspace, a hackerspace, or a Fab Lab. The report should be multimedia, including at a minimum pictures complementing text. But it could include audio and video. The visits and reports can be done in groups, and the number of sites visited and reported on should correspond to the number of people in the group (e.g., if two people are doing the visits together, they should visit and report on two different sites together). Prior to the visit, the person or group should do some background research on the site, its history, and its informing principles/theories. For instance, someone visiting the CU Community Fab Lab would visit the http://cucfablab.org/ website to understand the local Fab Lab context and history, and would also review resources such as http://www.fabfoundation.org/uploads/PedagogyEvaluation.docx to understand the national Fab Lab pedagogical framework. Each report should make specific links between their preliminary research, the material covered the first three weeks of class, and what they learned from the site visit. The only required “reading” for the June 17 class will be to review each others reports. Out of respect for peers, please have reports completed and uploaded to the course Moodle by June 14. June 14 and beyond: Studio Project Reports, Collaborations, and Critical Friends Feedback. Assignments and Methods of Assessment: Students will be graded on a 90% (A), 80% (B), 70% (C), 60% (D) scale. Graded assignments and the overall percentage for each category of assignments are listed below. Professional Journal (40% of grade): Each week students should spend about an hour writing down their reflections on the in-class discussions and in-field experiences from the past week. These will be posted to the Professional Journal forum. Students should also periodically comment on the reflections of other students to affirm and expand upon lessons learned. In all posts, students will be expected to develop their capacity to bring into dialog: 1) personal histories, field experiences and knowledge; 2) the insights of authors from this and other classes; and 3) lessons learned from in-field professionals and community members. Overall, in lieu of more classroom contact hours, students will be expected to use professional journal entries and open discussion forum to extend dialog on in-field experiences, readings, and project ideas. In-Field Program Delivery and Documentation (50% of grade): Students will work with an agreed upon community partner over the course of the semester on a project related to digital literacy and/or informal learning spaces. The nature and scope of the project will be developed as part of the early CI studio class in collaboration with student peers, the course instructor, and community partners. In developing the scope of the project, an appropriate form of documentation will also be considered. This project will then be the primary focus of the studio for the final 8 weeks of the semester. Class time will be used to report back on progress, to participate in critical friends feedback sessions, and to collaborate as a community of practice. Most of the project work will require outside class time to accomplish. Instructor Evaluation (10% of grade): The instructor will evaluate student attendance, active participation, and overall progress throughout the course of the semester. The following rubric will be used to assign a score at the end of the semester. 10 = Student has been an active participant in class discussions based on assigned readings and lived experiences and is demonstrating an increasing grasp of the key concepts covered in class. 8 = Student has been an active participant in some of the class discussions based on assigned readings and lived experiences and is demonstrating some gains in grasping key concepts covered in class. Attendance and Participation Policy: Students are expected to attend all class sessions except in case of emergency. If you have an emergency, communicate with the instructor as early as possible to prevent negatively impacting your grade. Unless otherwise negotiated with the instructor, students with an excused absence will still be expected to complete professional journal entries. It is expected that students will participate actively in the class activities and discussions in a professional manner, showing respect for differing ideas and a willingness and ability to defend their ideas by referring to relevant readings. Academic Integrity: Students should review and follow the University policy on academic integrity, available online at: http://admin.illinois.edu/policy/code/article1_part4_1-402.html . When you submit an assignment, you are certifying that the work is your own, or that of your project group, and that all use of other people’s material is used in accordance to fair use and copyright policies and is properly referenced. As applied to LIS490ST, technology is broadly defined as a socio-technical system that includes the physical component, its design, its application, and the training on and use in community. The class recognizes that technology as applied in society is not socially or culturally neutral. Every technology instance reflects the cultural and societal history, norms, and values of those who participated in its design and implementation and equally reflects the absence of the cultural and societal history, norms, and values of those who did not participate in its design and implementation. Further, the adoption of technology will have unique positive and negative impacts within each community. However, considered, participatory adaptation of technology has the potential to help make its adoption more inclusive. The readings and in-class discussion are meant to help each of us take a more considered approach to the adaptation and adoption of technology in community. Difference is a critical resource in this process, and every student is asked to complete readings in advance of class and to bring their insights to the discussion to inform us on the issues as expressed in the statement of inclusion.